Now is the time of year after Christmas where you can get some great deals on your favorite Stampin' Up! products. You don't have to leave the comfort of your home or deal with the crowds (YAY!) New items were just posted today on the Clearance Rack Blitz! There are some items on there that have not been seen in a while and this is your absolute last chance to get them at such a deep discounted price. 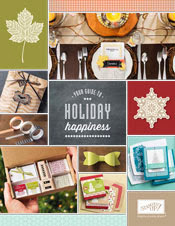 The holiday catalog only has a few days left to order from too. There are some items that are carrying over, and you can click HERE to see those items. Here are the weekly deals that you can grab at great prices too. Don't wait....start your after-holiday shopping now! Your sale purchases can also get you Stamping Points, so that is a double bonus. Happy stamping!